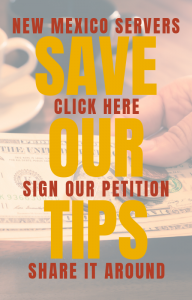 Servers/Bartenders: Click “Save our tips” to sign our petition. Share it with your coworkers. 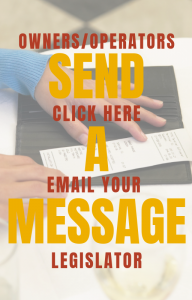 Restaurant owners/operators: Click “Send a message” to email your legislators and the appropriate committee members to tell them how it will impact your business. 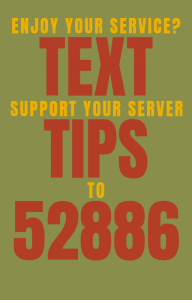 Customers: Make your voice heard and text message the word “TIPS” to 52886 to participate in protecting tips for the New Mexico service industry. Get updates on the status of our efforts on our “Wage Page” by clicking here.